The North Shore & Merrimack Valley area has a wonderful variety of fine museums & galleries. The story has been told in books, films, and on the stage: in a short period during 1692 and 1693, the puritanical town of Salem tried and executed 20 people for the crime of witchcraft. 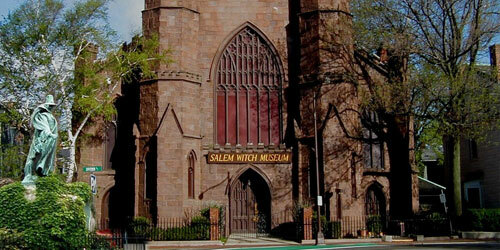 The Salem Witch Museum in Washington Square tells the story through exhibits and live performance. Haunted Happenings, in October, is a giant witchcraft and Halloween festival. Exploring historic Concord? Begin at the Concord Museum! For a small town, Concord has a big history. From the “shot heard round the world” to the writers of the American literary renaissance, things have happened here, words have been spoken here and books have been written here which changed the face of a nation. Over time, Concord has become a symbol of liberty and intellectual freedom. And nowhere is that important heritage captured more dramatically than at the Concord Museum. An inspiring collection of American treasures includes the 1775 “one, if by land, two, if by sea” Revere lantern, Thoreau’s Walden desk and Emerson’s Study. Linger in engaging history galleries, enjoy the beauty of Concord antiques, and create your own memories with family-friendly activities. Open daily year round. This state historical park describes the life and history of Lowell’s 19th-centry textile mills and the generations of immigrant workers that passed through their doors. The site includes a network of canals that furnished power to the textile mills along the water and a 2-mile esplanade along the Merrimack River. This gallery-type museum has 50 wax figures in scenes that show Salem's history from its founding in 1626 through to the witch trials 1692 and into it period of global commerce in the 18th century. In the Interactive area, you can learn to tie knots like a sailor, create a gravestone rubbing, or feel what it’s like to be locked up in a life-size re-created jail cell. Other offerings are a guided tour called The Salem Witch Village, and Frankenstein’s castle. Hours vary by season. See hours of operation. Follow the history of maritime Massachusetts through the exhibits at this museum. Hours: May 15 to December 21, Tuesday-Saturday, 10 a.m.-4 p.m.; Sunday & holiday Mondays, noon to 4 p.m.; January 1 to May 15, Saturday, 10 a.m.-4 p.m.; Sunday, noon to 4 p.m. Admission: Adults, $7; seniors and students, $5, Information: www.customhousemaritimemuseum.org. The birthplace of James Abbott McNeil Whistler. Exhibits of Whistler's and others' artwork. Hours: Wednesday-Saturrfday, 11 a.m.-4 p.m. Admission: $5; seniors and students, $4. The Essex Shipbuilding Museum tells the story of a New England village that built more two-masted wooden fishing schooners than any other place in the world. Visitors to the museum will see shipbuilding tools, photographs, exhibits about the shipbuilding industry, and the schooner Evelina M. Goulart. Guided and self-guided tours are offered. A gift shop offers ship plans, maritime books, T-shirts, toys, CDs, and maritime memorabilia. Hours: Summer: June-October, Wednesdays- Sundays, 10 a.m.-5 p.m.; after mid-October, open weekends, 10 a.m.-5 p.m. Admission: Guided Tour, $5-$10, depending on age; self-guided tour with Shipyard Map, $7. John Hays Hammond, Jr. built his medieval-style castle between the years 1926 and 1929 to serve both as his home and as a backdrop for his collection of Roman, medieval, and Renaissance artifacts. Visitors to Hammond Castle Museum may explore the castle on a self-guided tour of eight rooms including the great hall, indoor courtyard, Renaissance dining room, two guest bedrooms, the inventions exhibit room, and the tower galleries. Visitors may also enjoy the beauty of the castle grounds and a view of the Atlantic shore line. Hours: Open April-October; call ahead for hours. Admission: Adults, $10; seniors over age 64, $9; children age 6-12, $8. Admission: Adults,$8; children ages 1- 18, $6. Museum features collections of horse-drawn carriages and Native American artifacts. Hours: Memorial Day to Labor Day, Friday and Sunday, 1-4 p.m.; Saturday, 10 a.m.; other times by appointment Admission is free. The Peabody Essex Museum collection presents works from the 1700s to today: paintings, sculptures, photographs, drawings, textiles, architecture and decorative objects, include African, American, Asian, maritime, Native American and Oceanic art. Many interesting changing exhibits. Wonderful gift shop. A large, light-filled atrium is a place to sit, eat lunch, watch a performance. Hours: Tuesday-Sunday, 10 am-5 pm.